How do I set up Tax on the POS App? 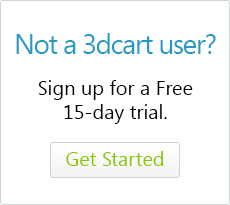 Enter a name for Tax 1 and enter a percentage rate for that tax. If your tax area requires multiple tax rates, these can be entered into the Tax 2 and Tax 3 areas as needed. Once the tax rates are set, they will be applied to orders as they are created via the POS App. At the bottom of the Tax Settings interface, you will see a toggle labeled "Include discount on tax calculation." 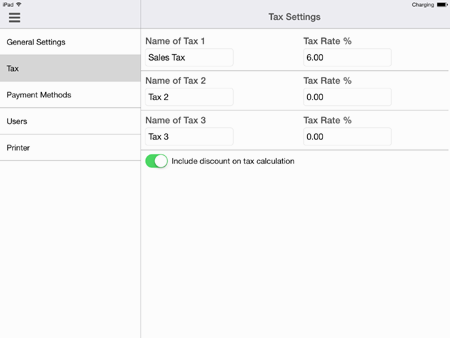 This setting will be used for situations where you would like to calculate tax on the order after discounts have been applied to the items on the order. For example, let's say that you have an order for a $15 item and the applicable tax rate is 5%. Normally, this would result in a $0.75 tax charge. However, you've given the item and additional discount of $5, making the item $10 now.